I think you can, I think you can. Day three (of four) of the giveaway bonanza. If you don't like giveaways ... go away and come back again another day. Like maybe ... Monday. Thanks a trillion!! All Grace, all the time! I'm really trying to spice up my poses with some hair touching and I'm thinking I won't be doing it again. No, I really think my valiant photographer just caught me delicately fixing my hair but these were some of the few photos where I wasn't slit-eyed and/or laughing at Simon's go-to question, "so why do we take these photos again?!" .... touché. I have to confess I used the discount code from my last giveaway with White Plum to buy this grey dress because I'm a sucker for a staple in a drab color. And I wear it way, way too much because it can be dressed up and dressed down and worn all around town. Poet Grace is retiring right .......... now. But, really - it is a very lightweight sweater material so it keeps my frozen self nice and toasty even in our drafty house. Switching it up dramatically and moving onto a different category of warm clothing talk a la fleece lined leggings. Why oh why I have not hopped onto the fleece lined everything bandwagon is a tragedy and a mystery because they are life changing for this cold-blooded snowmom. Do I wear them to bed and then simply throw jeans over them to leave the house? I might. And am I tempted to chuck all of my tights because they don't hold a candle to the level of warmth and comfort that these puppies offer? Absolutely. Anyway, there's so much more to White Plum than the basics (statement piece central!) as illustrated by this fun cardigan, this other fun(ner?) cardigan, and this stunning dress. And I know I've blogged about them before but their tunics are my absolute favorite to wear with leggings and boots in the winter. I'm kind of wondering if they emailed me a typo but they are offering Camp Patton readers (or readers of just this post! you don't have to commit to the whole blog!) 40% off the entire site with code: PATTONHOLIDAY40 until December 14th ... so go as crazy as you'd like. Personally, I'm eying this maxi skirt for myself. And what would a string of giveaways be without the actual giveaway? A lie. So White Plum is giving away a $100 credit to one of YOU. You know the drill by now .... get after it. fingers are crossed. yes, all of them. The Mallory Open Cardigan is my pick! Adorable!! I think I'd have a tough time actually choosing, but the Cambridge Hooded Tunic is kinda calling my name. I've been pining over the fleece lined leggings for weeks now.. don't know why I haven't pulled the trigger yet. Winning this card would be the tipping point! The fleece lined leggings would make living in the Northeast so much more bearable for this California transplant. The Winter Elk leggings are cute! Definitely the Solid Fleece Lined Leggings in black. My legs feel better already. I need some more leggings to get me through winter! The Nizhoni Tunic is crying out to join my closet. Just saying. One of each please!!! Ill take it all! Especially that blue dress! I would love some of those fleece-lined leggings! I love the Mallory open cardigan! I think I need a pair or two of fleece lined leggings! All about those stardust metallic leggings....hello! That archer oversized sweater is so cute!!! WP kinda already owns me and I swore off shopping after my black friday/cyber monday damage but...now I think I need that sweater dress. P.s. it looks better on you than it does on their model! autumn rain shift, twiggy shift, blue ivy shift. I basically love all the shift dresses. I love the Lilith Ruffle Tunic! So cute! It would be great to pick out a new piece or two for postpartum wear! Obsessed with the Whittier Open Cardigan. Looks so cozy! I LOVE the Cozy Leggings Hoodie in charcoal!!! Obsessed with the fleece lined leggings! The Darling Daisy Party dress is adorable! I would love it in the wine color. I like the Cordova Multicolor Caridgan. The open cardigans and tunics are at the top of my list! I NEED that gray dress! I LOVE that pleated maxi skirt! SO cute. Love the Addison polka dot dress! I love your grey dress. I'd take one. Love the studded slate blouse- very post partum belly friendly! 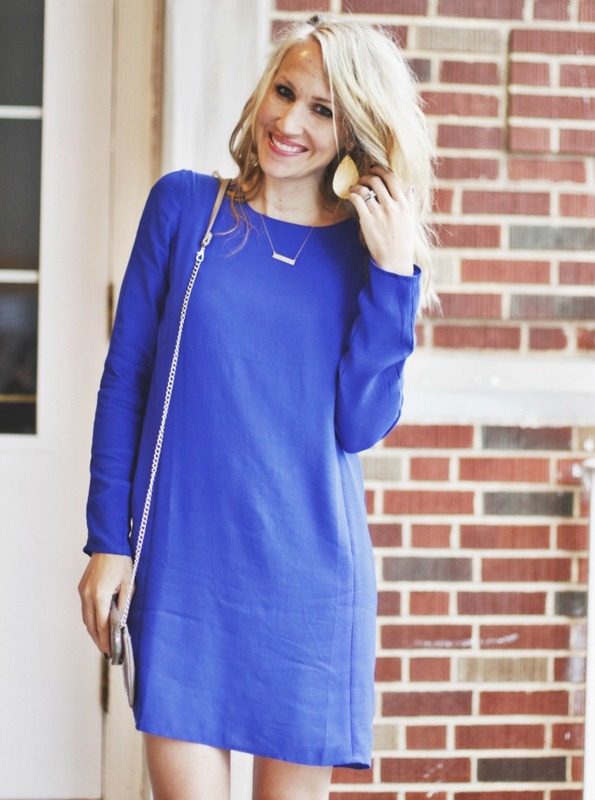 LovE the Tate colorblock tunic dress!! I like the Tori Colorblock Tee and the Barbara Shift Dress. That red coat you're wearing is too cute! Sweater dresses, tunics, and leggings... Oh My! Their tunics are very cute. I think the Carmen Suede Pocket Tunic and the Hooded Tunic Dress are the cutest. Comfy, casual, fun! Navajo fringe cardigan. What a great print! Love fashion acceptable blankets! Well I have to say that the Liesl Embroidered Blouse is my favorite because... why did no one tell me they named a blouse after me?! WHY?! Gah they don't have my size left! WHYYYYY. I love the Mont Blanc tunic. Thanks for hosting this giveaway!! I NEED that blue dress!!! Oh my gosh can I just have all of the tunics? I'll especially take the Cambridge hooded tunic, please. Love the Middleton day dress! And of course, the fleece leggings. The cable knit fleece leggings look awesome! Some fleece lined leggings sound amazing for utah's winter tundra!! ThE log cabin leggings are cute! White Plum is my favorite new store! I could really use some more leggings...my pregnant self hates pregnancy jeans, and the fleece lined leggings have become a staple for me. Cozy leggings Hoodies would be a must-have for my post-partum self, plus some fleece-lined leggings. :) also love the sequoia open cardigan! I think I would wear the face colorblock tunic all of the days, ever. The solid fleece leggings would be awesome along with the leggings hoodies! Loving the Mallory open cardigan! The Kelley Open Cardigan is gorgeous! Toggle boot cuffs are too cute! So many good choices but I think the Danielle day dress is my favorite. Although I wouldn't hate the vintage floral leggings either. Fairly certain my former self donned some iteration of them (with stirrups! Can we give thanks that those remained dead when leggings were resurrected)? I think I would be most tempted by their Albuquerque Aztec or Prudence Keyhole blouses. Beautiful! Clementine Scalloped Shorts would be perfect for family vacay at the beach next month! I love White Plum! I'm expecting a package of their fleece lined leggings to arrive any day now--can't wait! I like the Walk This Way embroidered blouse. I love the Victoria dress! This grandma thinks these would make awesome presents! I very much love the Royal Notting Hill Gate Dress! You look lovely, as always, Grace! Oh wow! I love the signature Stella tunic! Perfect for the Christmas time! I love the Let It Snow cardigan! I'm thinking I need the Signature Stella tunic in every color! I love the Prudence Keyhole Blouse! I'm liking the Ultra Flattering Dolman....because it's ultra flattering? Looks cut just right to cover mommy tummy. Still looking for a nursing friendly tunic-y top to wear with leggings too! I want some LEAH PEEP-TOE WEDGES in red! And some SOLID FLEECE LINED LEGGINGS in navy! I'm loving the archer oversized sweater. Bring on the warm and cozy! Oh my gosh, the Sophie Infinity Scarf is super cute and looks wickedly soft. I also really like the zipper quilted vest, the Persephone layered necklace, the chevron charm necklace, and the Skylar ankle booties!! Fleece-lined leggings sound amazing right now, esp. in the Wine color. Darling daisy party dress is the one I love! The out of the blue cardigan is adorable!! Love love that coat Grace, you look great! ooh I love the Evelyn lace tunic dress! SO cute! I love the modal ultimate leggings tunic and the pleats and thank you dress - great party and date night dress! I agree with your comment on thr fleece lined leggings....super warm and comfy! I love the Sarina day dress! Really love the gray dress - I'm all for drab. And I'll be postpartum in t-minus 3 weeks, and have absolutely nothing to wear. Here's hoping! Not sure my commented posted. Please delete this one if so! I love the Danika Embroidered Blouse AND the Floral Canvas Blouse! I love that grey dress.. and their tunics. The keep it simple, that is. Oh man, I love the Faye colorblock tunic. So pretty! I like the ella knit tunic! Faye color block tunic for sure! But I would love some fleece lined leggings in olive too! I want...all of the White Plum things. But right now I especially want the Out of the Blue Fringe Cardigan. And maybe also the Gilly Knit cardigan. Among many many others! I love the Nothing But a Houndstooth Cardigan and A-Maze-ing Doleman Cardigan! So many cute options! I love the Lilith ruffle tunic!!! So cute!! I think I need a comfy Sarina day dress to wear with my fleece lined leggings! I love the Ella Knit tunic! I've been looking for something just like that! I would love the fleece-lined leggings, especially as we're considering moving to Minnesota! White Plum has so many cute items, it's hard to pick just one! I am curious to check out the fleece lined leggings though. Glad you're back, Grace! I have been looking for something like the Beachside Bonfire Cardigan. So that's my fave pick. I also love the fleece lined leggings and the stardust metallic leggings! so comfy and so fun! I'm a sucker for blue and white, and LOVE the Piece Me Together Sweater! Audra paisley dress for the win!! Love it! Love love love the Stella tunic! Already have one - would love another!! i'm a huge fan of whiteplum and LOVE their leggings, I need more to order so I can get a full cart!!! The gray dress is going in my 'must have pile' now! I love the look of the White Plum tunics and leggings. My favorite tunic right now is the Ashland one in the black and white stripe. All of the leggings!! The Mallory Cardigan and cozy legging hoodie look so awesome!! Okay. Take 2. I love all the tunics but I think the Carmen suede is my favorite. And lined leggings are the bomb. Love the Kelly Striped Day dress... and of course the fleece lined leggings! I would LOVE the Fleece Lined Leggings!!! Love the Pleats and Thank You dress! Love the Stella tunics! I never win things, so here's hoping!! love the perfectly pleated blouse... and at least four other blouses! I have been eying ALL of their leggings...I'm currently getting to the end of my third pregnancy and leggings are where its at! But I think I might have to check out that dress, it is soooo cute! love their tunics, but need something that will be nursing-friendly... so maybe something like the studded slate blouse? plus fleece-lined leggings, of course. The Keep it Simple Day Dress looks adorable and comfortable. I wouldn't mind a few pairs of fleece lined leggings, either!! I want want want the red Madison handbag. I love red handbags. Love the Mallory open cardigan- super cozy looking! I love the grey dress!! keep it simple day dress! I would love the Gold and the Beautiful dress for New Year's Eve! I have been wanting to get more tunics to wear! I love the Mont Blanc tunic the best. So many cute tops! Love the fall floral blouse. I sure could use some of those reindeer leggings! The Brooklyn Chevron Infinity Scarf and the Pyrenees knit infinity scarf would both be great for this winter! Loving the sequins of events pullover. Gray dress and leggings for sure! love the crew striped tunic dress! That red coat is precious!! Love! It's seriously not fair how cute you are. LOVE that blue dress you're wearing! I have really wanted to try fleece-lined leggings in general, and I love the Lillith Ruffle Tunic! I want all the leggings! There are so many wonderful leggings! The log cabin leggings may be making an appearance in my sticking, and the cozy leggings hoodie may be under the tree (fingers crossed). I love the Damask Tile Tunic! I am in major need of tunics so I can wear nothing but leggings. I love the Country Chic Tunic Dress. That Beachside Bonfire cardigan?? Swoon. fleece lined leggings sound dreamy! And 40% off the whole site, INSANE! Man I want that coat. It is amazing. And I'm freezing constantly (running joke in my family. I would die if I lived anywhere but where I do.) so perhaps I should give these leggings a whirl. I love White Plum! I currently have my eye on the Archer Oversized Sweater! I am loving the Noir Pencil skirt, and I would love some fleece lined leggings. Ooh, the fleece lined leggings would make church on Sunday so much more bearable! I love the prepschool elbow patch cardigan! I LOVE the FATE: MARGAUX OPEN CARDIGAN! Oh I love the Carmen Suede Pocket Tunic! All the colors! oooh i love the natalie faux leather skirt! What a golden coupon!! But to win the giveaway?!!! I would probably start with a dozen pairs of the fleece lined leggings because.... Iowa winters. You look so pretty and I love so many of White Plums clothes. What a great discount. One of my favorite things is the A-MAZE-ING DOLMAN CARDIGAN. I love their big oversized sweaters and cardigans!! The skylar ankle booties and the diamond knit sweater would look great paired with skinny jeans! I love all of their leggings so much, especially the navy High Sierra leggings, too cute! Love the Lilith Ruffle Tunic to go with my awesome leggings!! I love the celeste lace tunic! such cute detail! This preggo would love the Starry Night Shift Dress :) Thanks! 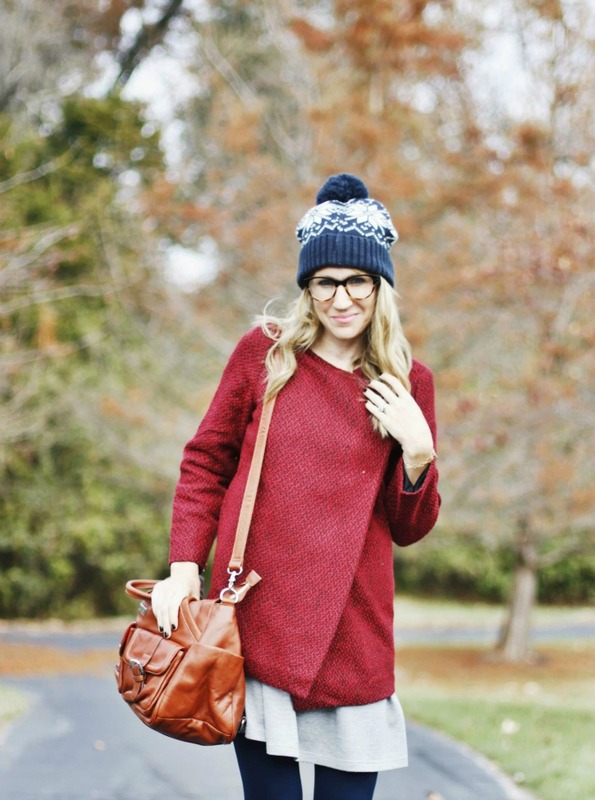 Cable Knit Fleece Leggings for the win! Even though I liked the majority of items on thier site. The darling daisyou party dress! The archer open sweater is great! But mostly I think I also need to stock up on fleece lined leggings--those sound awesome!